Although Batman and Superman will eventually become allies in Batman V Superman: Dawn of Justice, the title makes it clear that they’ll be butting heads at some point - and now we have a better idea of what this might look like on the big screen. A new picture has surfaced online of a T-shirt featuring Henry Cavill’s Man of Steel in a close quarters fight with Ben Affleck’s Dark Knight, the latter of whom has donned the appropriate protection to go toe-to-toe with the Kryptonian. The artwork on the T-shirt very much resembles the one Ben Affleck was shown wearing in the San Diego Comic-Con 2014 footage, and once again reaffirms how much The Dark Knight Returns is inspiring Batman v Superman: Dawn of Justice. As for Supes, he is also wearing his cinematic costume, which is only slightly adjusted from what he wore in Man of Steel. Despite Batman being at a disadvantage not having any superpowers, the film is said to have an explanation for why they are able to throw down in fisticuffs. 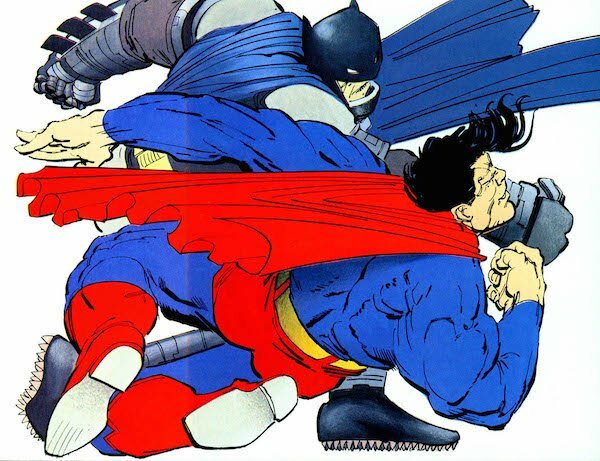 Depending on what footage is included in the first trailer (which is rumored for release next month), it may be awhile before we’re able to visualize what this will look like, - but if you want a general idea, just read Frank Miller's graphic novel or check out the animated film adaptation Batman: The Dark Knight Returns. As for the shirt, even if it isn’t the real deal, I would probably buy one for myself anyway. It looks spectacular! Batman v Superman: Dawn of Justice hits theaters on March 25, 2016.